This has joined the three dozen examples of arrowheads with inscriptions that show ownership. The language is always West Semitic, or "Canaanian" (the language of Canaan, particularly its Hebrew and Phoenician forms). The script is an early version of the alphabet. The letters have lost their pictorial style, that is, the objects they originally represented are no longer recognizable, and they are now neutral. The word for "arrow"(HS in Hebrew and Phoenician) is usually found at the beginning, and that is the case here: on the lower picture, on the right, reading from right to left, we see the H (an emphatic h) looking like a square 8, and then the S (an emphatic s) resembling 7 with a tail, or a reversed S.
Remember, vowels are not shown, only consonants, in early alphabetic inscriptions. The next letter is shaped like W, and it says Sh. This could mean "of", but it is more likely to be the initial letter of the owner's name. The angle and the circle (a boomerang and an eye) are G and `ayin; so the name would be ShG`. G Sh Z Sh G |. The vertical bar may be an indicator of the end of the line, but under the circumstances it is unnecessary, since the reader can start at either end and achieve the same result. The G could be P again but facing in the opposite direction; or all three angles could be G.
Here is a suggestion for interpreting it. "Servant, return this when it has gone astray". G says gml with connotations of return (as with the boomerang the sign depicts), give back, or collect (Arabic). Sh is sh-m-sh, "sun" or "servant" (widely used Semitic root for "serve"). ShG (sh-g-y) means "stray, go astray, err". Z is "this" or "which". Of course, scholars trained in the old school of William Foxwell Albright will not allow such logographic use of the letters of the early alphabet, but it was permitted in the pictorial stage of the proto-alphabet, as I have shown in my interpretation of one of the oldest examples we possess, namely the Wadi el-Hol graffito from the western desert of Egypt; and apparently it was still being practised in the text on the Izbet Sartah ostracon, early in the Iron Age. I have the feeling that the owner's name was inscribed on the arrow, for this purpose: if it got lost ("strayed") it could be returned to its owner by a servant who ran to collect it. But, as I always say, only the person who wrote the inscription knew for certain what it meant. Note that some scholars who have seen this have told me that they are extremely suspicious of it. 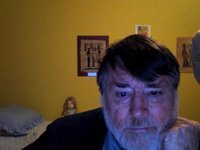 But if it is not original, it is still worth inquiring about the forger's intentions; the word for arrow is correct, so the rest of the text might have meaning; it could have been copied from another arrowhead onto this one. So, if we may assume its authenticity. and consider the letters, we can say that the Zayin belongs to the Iron Age, since it was originally ]><] and was eventually reduced to |--|, though here it has the more usual upright stance. The `ayin is an eye, and in the Bronze Age it was a natural depiction (similar to the shape of that arrowhead) normally with the pupil shown; in the Iron Age it became a circle, sometimes with a dot in it, but this disappeared, as in this instance. However, the circle-sign appears with and without the dot on the the Izbet Sartah ostracon, on the Beth-Shemesh ostracon, and on other contemporary arrowheads, notably a set found in a field at the village el-Khadr, near Bethlehem. But the dotted circle appears consistently on the Qeiyafa ostracon (dated around 1000 BCE in the lifetime of David). 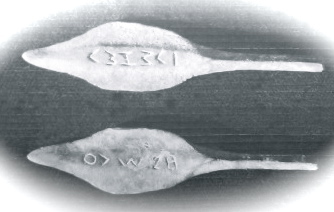 On that same Qeiyafa inscription (line 2) we can see the two forms of Shin (vertical and horizontal) that appear on this arrowhead; and also a P like the one in second position on that line 2. After close examination of the evidence, I have suggested that for a time the proto-alphabet was used as a syllabary, and each of the 22 letters had three forms, each representing a different vowel (examples: Ba, Bi, Bu). And, as already stated above, there was a man named Ship`i who was of the tribe of Judah. The Lost Link: The Alphabet in the Hands of the Early Israelites. bridges Proto-Canaanite and Early Phoenician. See Biblical Archaeology Review Vol. 30 No. 6 for illustration of one example and Vol. 25 No. 3. for an article describing the great importance of this script in the development of the alphabet with two additional illustrations. (Copies of these articles will be provided to the buyer.) These are the earliest known examples of alphabetic writing which was then adopted by the Phoenicians and eventually passed on to the Greeks. Excessively rare, the article cites only 34 known examples. This example is considerably nicer than most of the others. 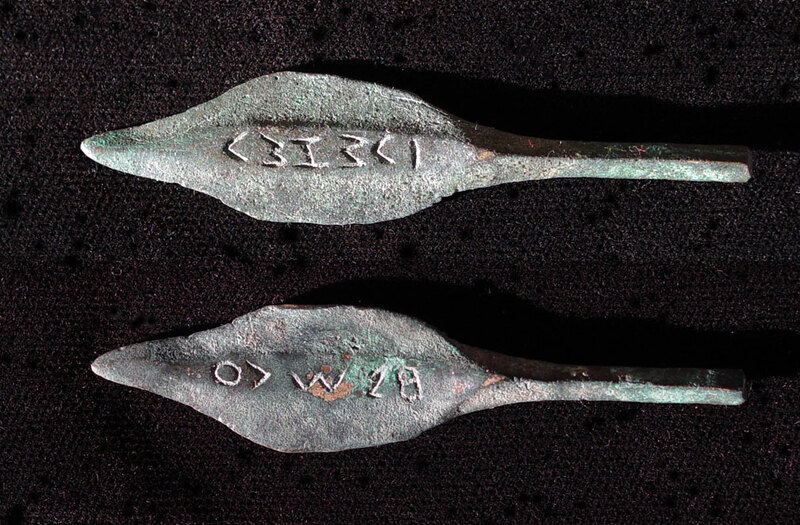 It has undergone extensive examination under magnification which confirms traces of ancient patina within the inscribed letters and that the entire surface within the inscription is essentially the same as that of the surface outside them thus confirming the inscriptions are original to the piece.